Kill la Kill takes fanservice to a whole new level with bombastic costumes for both the boys and girls! This is a closer look at the hot characters of Kill La Kill. Kill la Kill, directed by Hiroyuki Imaishi, is an anime that presents a society ruled with an iron fist. The series focuses on the struggle of a girl who uses the power of her Kamui in order to defeat the system and find the truth about her father's death. Read on to learn more. Satsuki Kiryuuin only dons the Kamui Junketsu on special occasions - when she really needs to put a hurting on someone! While Kamui Senketsu gets the majority of the screen time in Kill La Kill, there is plenty worth knowing about Kamui Junketsu as well. 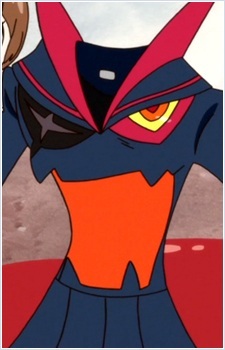 Senketsu is Ryuko's kamui in Kill la Kill. Hen enables her to be a more capable fighter and helps her accomplish her goals. What is a kamui? How doesn Senketsu do this? What is their relationship like? Let's synchronize with our life fibers and find out!